Experimentation; exploration; excellence. These three Es are embedded in ODC Theater’s DNA, and their current artistic endeavor, curated by ODC Deputy Director for Advancement Christy Bolingbroke, provides further confirmation. The Music Moves Festival takes the ODC Theater stage into full incubator mode, with the goal of discovering, uncovering, affirming and highlighting the distinct relationship between dance and music. To that end, Music Moves welcomes over a dozen performing artists in eleven different programs over three plus weeks – a significant number of unique perspectives on dance and music. For the festival’s shared seventh chapter, two stunning contemporary companies brought three dance works, each speaking distinctly to music and sound: Paufve | Dance in 2013’s “Soil” and Kate Weare Company in “Drop Down” (2007) and “Still Life With Avalanche” (2014). All three pieces certainly had noteworthy construction and performances. Yet with this festival’s focus, it seems right to concentrate the majority of comments and observations to the connection between choreography and musical composition. Pictured: Randee Paufve in "Soil"
Juliana Monin) took on the set of five solos (choreographed by Gregg Bielemeier, Della Davidson and Paufve). This time “Soil” was not mobile, instead unfolding in a proscenium arch space with a more traditional audience/performer arrangement. In addition, the dance had no stops and starts, it fed seamlessly from one portion to the next. Considering the work within the context of Music Moves’ theme, “Soil” examined contemporary dance alongside a collection of live music and recorded scores. There is somewhat of a bias that dance performance with live music elicits better results, but “Soil” illustrates that the pairing of movement with both recorded and live music can be revelatory. In the opening solo, Paufve and cellist Chris Evans engaged in an active conversation. Though the choreography and music both appeared set, the music was not accompanying the dance nor was the dance prescribed to the music. Together, they were creating a live state of reaction and interpretation. A perfect example was when Paufve drew her arms and leg across her body in retiré passé, while Evans similarly stretched and extended her note. In the second variation, Miner approached the mixed musical articulation of a recorded score. Equal parts detached staccato and lush legato peppered the complex composition, handily expressed by Miner. A particularly beautiful moment was when those two articulations came together in the movement – she shot her arm into the air like an arrow and then immediately gathered it into a flowing, circular pathway. Peiling Kao’s post-modern solo had a combination of recorded and live music (by Elijah Wallace at the piano) and it was her character that evolved depending on the type of music used. With the piano, whimsy and playfulness took over and with the recording, a more staid, controlled state was present. In the fourth segment, a wind-based soundscore helped create a setting and environment that framed Paufve’s dramatic solo. After last year’s viewing, I noted that from time to time, the music and movement in “Soil” didn’t match, particularly in the fifth and final solo (danced here by Monin, then Paufve, with Wallace again on the piano). While I still noticed that discord at this performance, I could also see and hear it with a new mindset. There was a conversation between the physicality and the sound; it was just on two different wavelengths. Same topic, two opposing opinions – we have all had interactions just like that. The takeaway from 2014’s iteration of “Soil” is that both live and recorded music can collaborate with choreography in real-time. in Kate Weare's "Drop Down"
intention – to produce a feeling of purposeful uneasiness. The harsh, dissonance sounds were periodically difficult to listen to, and Weare’s movement had similar moments of tumult (Johnson’s drop to the ground following a gorgeous knee lift drew gasps). And what the audience learned here about music and movement is that both disciplines were necessary to craft this level of narrative instability. “Drop Down” was on the edge, unexpected and provocative and incidentally, was also the best piece on the program. Closing the evening was Weare’s “Still Life With Avalanche”, a trio danced by Dennis Adams, Justin Andrews and Anne Zivolich (also guest artists appearing courtesy of ODC/Dance). 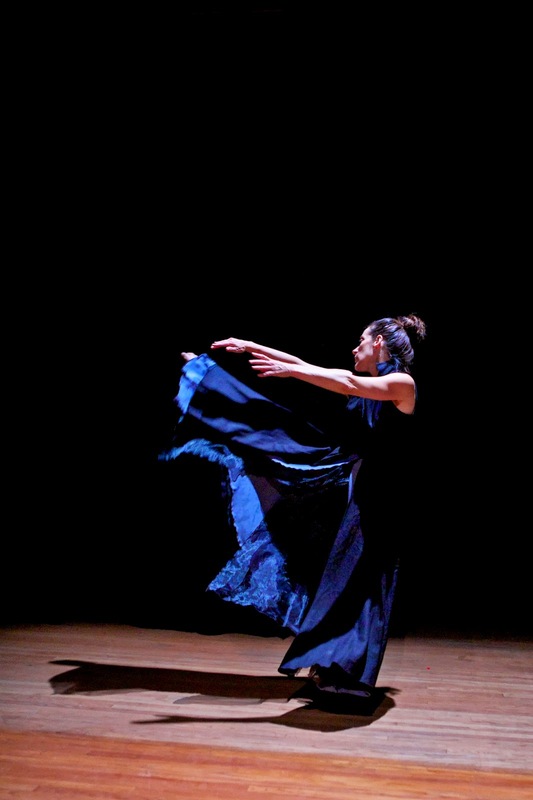 Directed in partnership with Brenda Way and with recorded music by Wolfgang Capellari, Gerard Pesson and Missy Mazzoli, “Still Life With Avalanche” was an example of ‘new’ neo-classical choreography. Sounds like a redundant term, but “Still Life With Avalanche” really shows an updated version of this celebrated choreographic style. One of the primary tenets of neo-classical choreography is how the steps mark and emphasize the score. “Still Life With Avalanche” had this in spades. From the initial crawling to parallel jumps in first to the swinging, metronome arms, the recorded composition was reflected well on the stage. What moved the style into this ‘new’ neo-classicism was the choreographic vocabulary itself. The movement choices were innovative and risky, fresh and of this moment – it was clearly a daring approach to neo-classical structure. One noted highlight was Zivolich’s pencheé arabesque. She extended her leg fully and when we thought the movement was over, her foot rotated in a complete circle. And the final moment of the dance brought a burst of surprise as the trio darted to the floor in the points of a triangle. Having said that, “Still Life With Avalanche” did suffer from some dynamic stagnancy. Much of the time, the movement and the music existed at the same intensity level, which led to some long lulls. And so, it was a slightly odd choice for the finale of this otherwise powerful program of sound and physicality.